For several years, museums, galleries and studios have wanted Kathleen to make prints from the original drawings of her artwork. 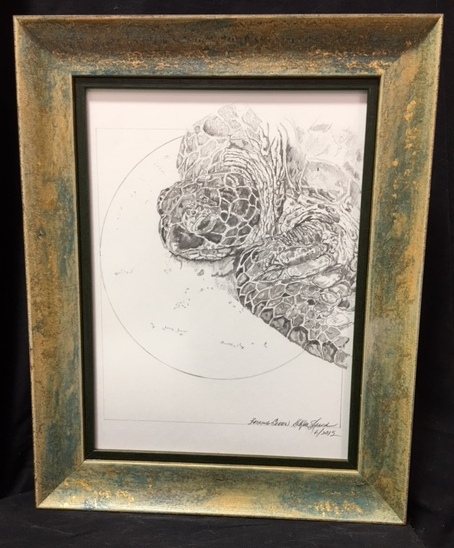 Each drawing is more like a scientific sketch, some with numbers and notes of the colors and the layers of dimension, and for pre-fused parts that will be included in the final wildlife glass piece. To the right of each print is the finished wildlife glass art work, with exception some of the glass is not completed at this time. 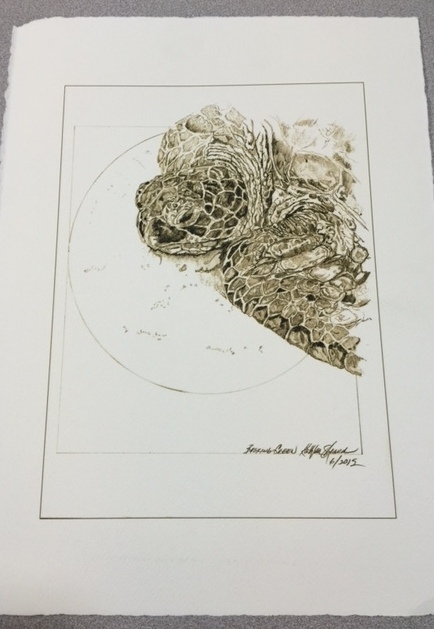 Each print is done in sepia tones on Arches paper. Majority of limited editions are 27 prints signed and numbered, or otherwise noted. The Basking Green sea turtle print is a Special Limited Edition of 28 signed and numbered prints. The monies raised from the sale of this print goes to finish the necessary funding the Cycle of Life :Sea Turtle Glass Sculpture – Environmental Art Education Project and sea turtle conservation organization donations.